Home > Shop By Brand > FLEX Polishers FREE SHIPPING! > FLEX PE14-2-150 Rotary Polisher FREE SHIPPING! - Free Bonus! FLEX PE14-2-150 Rotary Polisher FREE SHIPPING! - Free Bonus! For a limited time only, receive a FLEX Polisher Bag FREE with your purchase! 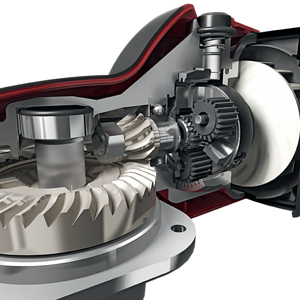 What German engineering did for the Mercedes Benz, it has now done for the rotary polisher. The FLEX PE14-2-150 Rotary Polisher makes paint correction and polishing easier than ever before! This is the Mercedes of rotary polishers - smooth ride, superior handling, and German engineering. The FLEX PE14-2-150 Rotary Polisher is well adapted to the needs of the user with benefits you won't get from another rotary buffer. The FLEPE14-2-150 Rotary Polisher was developed in Germany and is making its U.S. debut at Autogeek booth #12645 at the 2010 SEMA Show. At Autogeek, we're very pleased to offer this superior circular polisher to our customers. Our testing in the Show Car Garage has revealed that the FLEX PE14-2-150 Rotary Polisher is lighter, more agile, and easier to control than any other rotary polisher in our arsenal. It's well adapted for newcomers to the hobby, but it delivers the results that a seasoned pro expects from a rotary machine. You can see the FLEX PE 14-2-150 Polisher is shaped to give your hand and wrist a comfortable place to rest during operation. 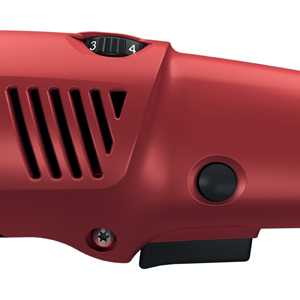 The FLEX PE14-2-150 Rotary Polisher is built to minimize user fatigue with an ergonomic design and lightweight body. It weighs in at just 5.6 pounds! The front of the polisher is perfectly curved to fit the user's hand and coated in rubber for superior comfort. The spindle lock mechanism is located behind the hump you see above so you cannot accidentally press it. This is not the heavy, cumbersome polisher of the past. The FLEX PE14-2-150 Rotary Polisher is built to be light, agile, and fast - perfect for professional detailers who spend hours behind a buffer. To make your polishing experience even more pleasant, the FLEX PE14-2-150 Rotary Polisher is quiet. A new combination of planetary and bevel gear provides extreme noise reduction. The gears are hardened stainless steel for excellent durability. The new gears are quiet and ultra-durable! Large vents and an internal fan provide superior air flow to keep the polisher cool. A powerful internal fan provides optimized airflow to cool the engine and transmission to prevent heat buildup in the polisher. A cooler running polisher operates more efficiently and is easier to handle. The FLEX PE14-2-150 Rotary Polisher is powerful! It has a 1400 watt motor with a no-load speed range of 600-2100 rpm. It's capable of high speed compounding, but it also works smoothly when polishing at low speeds. A convenient acceleration switch allows you to start slow and gradually increase speed. Lock the speed for continuous operation. Like all FLEX polishers, the FLEX PE14-2-150 Rotary Polisher has some sophisticated electronics to help you get the best results. VR electronics include variable speed selection, consistent speed control by tachometer generator, overload protection, restart protection, and temperature monitoring. The acceleration trigger, trigger lock, and speed dial are all within easy reach on the FLEX PE14-2-150 Polisher. The FLEX PE14-2-150 Rotary Polisher was designed and built in Stuttgart, Germany, just a short distance from the Mercedes Benz plant. It's no wonder that FLEX consistently produces some of the finest car polishers on the market - they share a hometown with one of the world's finest automakers. If you're new to polishing with a rotary or just looking for a more user-friendly machine, the FLEX PE14-2-150 Rotary Polisher is the perfect choice. Its lightweight, ergonomic design and cool-running, quiet motor will make polishing your vehicle almost as enjoyable as seeing the final results. Power input 10 Amp/1400 watt Weight 5.6 lbs. Flex PE14-2-150 Rotary Polisher 5.5 Inch CCS Pad Kit FREE SHIPPING! Flex PE14-2-150 Rotary Polisher 6.5 Inch CCS Pad Kit FREE SHIPPING! Club FLEX Intro Kit FREE SHIPPING! FLEX PE14-2-150 Marine 31 Boat Oxidation Removal Kit FREE SHIPPING! View more in FLEX Polishers FREE SHIPPING! I have been using a Makita polisher for many years, it was time for a new polisher and I don't trust the quality of Makita currently. So I tried the Rupes and the Flex at SEMA. I ended up with the Flex and am very happy with it so far. It is light, compact and quiet. Not holding an extra two pounds is wonderful. The only downfall was the free carrying bag, the zipper was opened so far I had to use pliers to try and pull it, that broke one side. This polisher has a lot power for its size. I would recommend this polisher. The Flex along with the Rupes have been the industry standard for all other to emulate. The performance of this machine is flawless. Itâ€™s very light compared with the Dewalt it replaces making vertical buffing a lot easier, plus the lower speed allows for a better finish as well. This is a top quality tool that you buy once! This Rotary is another tool in my arsenal, I have the flex 3401 and I love it. And Now I love the 150. It is the cadillac of buffers. It is well Balanced, it is super light. I could use either Flex for hours and not get tired. If I had to use Dewalt my arms would get tired in about an hour. It's not cheap but you get what you pay for. CSR. did a single stage paint correction, and jeweled a hood and needed very little input form me, so well balanced!! !